When it comes to premium video on the Web, Hulu still rules. In the fourth quarter, the U.S. online audience watched 19.4 billin minutes of video on Hulu, which was twice as much as the how much viewers watched on the websites of the five major TV networks combined. Viewers watched another 9.7 billion minutes of online video on the websites of ABC, CBS, NBC, Fox and the CW. The chart above comes from a new Digital Year in Review report from comScore. While Hulu still dominates, the individual network sites are growing faster. They grew 82 percent in terms of time spent watching video online, compared to 17 percent growth for Hulu. 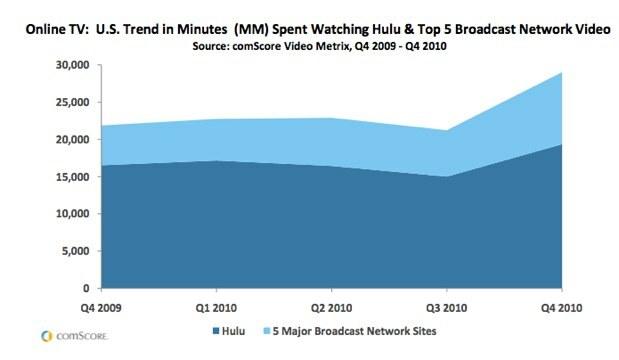 Taken together, Hulu and the five top networks, saw 33 percent growth in minutes viewed. Hulu has a love-hate relationship with the TV networks. They realize Hulu is a better distribution channel than their individual sites (people want to find all their shows in one place), but they also don’t want to cede their audiences to Hulu. This tension leads to constant negotiations with the networks and attempts by Hulu to move to a subscription model, at least on new platforms like the iPad.